One of my friends owns a t-shirt I like that has a funny slogan on it. It reads “This was supposed to be the future. Where is my jetpack.” It’s a daft joke relating to the sci-fi we watched as kids, the idea of the type of tech we would have in “the future,” technology that would change our worlds. Like lots of of people, I watched excitedly at the reveal of the Microsoft HoloLens last week and for the first time in a while I experienced some of that wonder and excitement we used to feel as kids. In essence what Microsoft have done is to create a set of cordless smart glasses that use high-definition 3D to project holograms into your real world. Like the next generation Google Glass, HoloLens is another Oculus Rift concept that runs from the new Windows Holographic platform for virtual and augmented-reality experiences. Now the possibilities for this are pretty endless, from the simple to the sublime, but the comms geek in me instantly started thinking about the impact that holographic content could have on marketing strategies in the not-too-distant future. But would this be a change for the better? Augmented reality (AR) isn’t a new thing. It’s been slowly gaining popularity for the last few years and is often thought of the next “it” thing in creative marketing. Both big names and small players have got involved, with one of the most memorable examples I saw last year being Pepsi’s #LiveForNow campaign. 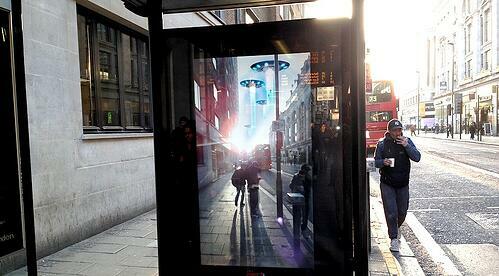 To give commuters an ‘unbelievable moment in their day’, Pepsi fitted one London bus shelter with a special camera, that showed UFO abductions, tiger attacks and giant robots as just some of the ‘unbelievable’ events overlaid on the real world. But while the Pepsi promotion has stuck in my mind for most of the last year, I’m not sure I could say whether it compelled me to drink more of their soft drinks at all. What is the goal of your communication? When you’re thinking of new marketing ideas to engage your user base, you’ve got to keep the customer journey in mind. Pepsi’s promotion was great for building brand identity but was its objective to actually increase the sales of individual cans? I doubt it. To succeed in employee communications, you need your technology to be seamlessly linked with the buying process or employee journey you are trying to create. If it’s not a natural journey, then you are simply putting another road block in the way of your customer getting to their final destination - and significantly increasing the risk of them falling off the path on their way. Calls to action are king. When it comes to SmartHub™, employee communications are very similar to point-of-sales pieces. We’re not directly selling something but we want our audience to see our communication and do something with it. We want them to act on a specific call to action. Visit the website, tell a colleague, sign up for a new initiative, whatever it is, the need for a specific reaction is the same. Recently one of my colleagues came back from one of our client’s sites really excited about an augmented reality comm they had produced with another partner. The concept seemed initially simple, they’d produced a brightly coloured table topper with certain key images acting as markers. When you scanned these images with your phone it kickstarted the AR experience. I couldn’t wait to take a look! We had to download an app we’d never heard of to be able to access the communication. Once we’d downloaded the app it took 3-5 seconds of holding the phone over the table for the app to pick up the image marker. We were then presented with a cool hologram! But the information we found at this point didn’t directly link to the final product meaning we then had to leave the app to be able to do anything with the information. Overall rather than getting the desired buzz from our augmented reality experience, I have to admit I felt slightly deflated and, maybe even frustrated. One of the keys philosophies in our communication strategies at Reward Gateway has always been to “keep it simple”. Any barrier that stands in the way of an employee becoming engaged with their benefits has got to be removed, and that includes omitting things that may initially seem exciting. I recently wrote another blog post about the death of the QR code and, while I’m sad to admit it, at present I think that augmented reality has to fall into the same ‘communication mistake’ category. But don’t worry, I’m not giving up. Somewhere in all of these exciting tech developments there is going to be a way to apply these theories to truly “knock your socks off” promotions. And with some of the ideas we’re currently working on in the RG Magic Lab, we’ll have some of our own exciting developments to tell you about pretty soon. That jet pack isn’t far away, but in the meantime we’re going to keep revolutionising employee communications the best way we know how; using targeted messaging and direct, simple communications that really work for our individual clients.